Hot on the heels of The Lego Batman Movie, 2017’s The Lego Ninjago Movie: brings us another (mostly) animated adventure. In this one, we go to Ninjago City and meet Lloyd (voiced by Dave Franco), a local high school student. However, Lloyd hides a secret life, as he also defends citizens as the Green Ninja. He works with his mentor Master Wu (Jackie Chan) as well as fellow crime-fighting teens. 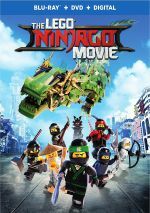 Lloyd suffers from problems because all-around bad guy Garmadon (Justin Theroux) is his deadbeat father. Lloyd tries to deal with his father’s threat and come to terms with their problematic relationship. Have audiences started to sour on Lego tales? While 2014’s Lego Movie took in a massive $469 million worldwide, Lego Batman dropped to $311 million. Still, with a relatively low $80 million budget, Lego Batman turned a good profit. 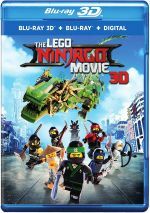 Ninjago struggled at the box office, though, as it made a lackluster $123 million worldwide – barely one-fourth of the first film’s take. Does this come from audience fatigue or just little enthusiasm for the story of Ninjago? I’m guessing it’s a combination of these factors. As noted, Ninjago hit screens fairly close behind the release of Lego Batman. Barely seven months elapsed between the two, and that may have left audiences less enthused for more Lego adventures. In addition, Ninjago came with much less “brand recognition” compared to its predecessors. Obviously Lego Batman boasted the presence of the Dark Knight and his universe, while Lego Movie enjoyed a cast of characters packed with famous names. Ninjago includes no such “fame factor”. It lacks characters the average viewer will recognize, and I have to believe the absence of built-in audience hurt the film. 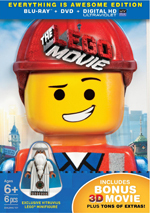 I guess we’ll get an idea if the Lego flicks have run their course when The Lego Movie Sequel hits in February 2019. That one will enjoy a connection to the immensely possible first movie, of course, and it’ll come with the character recognition that seems to help. As for Ninjago itself, it provides a perfectly competent animated adventure that does nothing to harm or elevate the franchise. Like my reviews for Lego Movie and Lego Batman indicated, I found both to offer spotty pleasures, and Ninjago mostly follows that trend. Actually, one aspect of Ninjago works better for me: the absence of the “brand recognition” that I mentioned. While the inclusion of so many famous characters may have brought butts to seats, I think those two films tended to overdo that side of things. This meant Lego Movie and Lego Batman tended to feel awfully busy. They shoved in so many different characters and themes that they could stretch themselves too thin. To my moderate relief, Ninjago suffers from less of this. Granted, it’s still pretty hyperactive, as it flits from one scene to another with abandon. But at least Ninjago comes with a more organic, coherent story. Granted, it’s essentially a riff on the Luke/Vader relationship – in a warped way – but the movie follows its path in a reasonably logical manner that avoids the “throw it at the wall” tendencies of its predecessors. Ninjago also manages decent amusement as well. It takes its cliché story and characters and warps them in a mix of moderately clever ways, many of which add some spark to the proceedings. We get a good cast here. Theroux camps it up in a fun manner as our baddie, and Franco manages to channel his inner “bitter teen” with nice results. Ninjago doesn’t pack in a star-studded group of actors, but it brings a crew of solid professionals who fulfill their roles nicely. All of which leaves me generally entertained but not terribly enthused. I do think Ninjago works better than the spotty Lego Batman but it doesn’t quite connect as well as I might like. 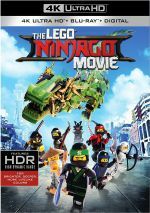 The Lego Ninjago Movie appears in an aspect ratio of approximately 2.40:1 on this Blu-ray Disc. This became a good but not great presentation. Actually, my only complaints related to definition, as wide shots could seem somewhat soft. Since both Lego Movie and Lego Batman came with similar issues, I must believe the filmmakers did this intentionally to give the Lego materials a more organic feel, but it still seems like a minor distraction. I saw no jagged edges or shimmering, and edge haloes remained absent. Outside of intentional “print flaws” added to the opening/closing credits, the image came free from defects. With a broad, peppy palette, colors acted as a highlight. Ninjago boasted a wide array of hues, and these looked lively and full. Blacks came across as deep and firm, while shadows showed nice clarity and delineation. Outside of some potentially intentional softness, this turned into a pleasing presentation. Downconverted to Dolby TrueHD 7.1, the film’s Dolby Atmos mix offered a rollicking affair. The movie came with plenty of action, and the audio made good use of those moments. This meant a strong sonic barrage, as various elements such as rockets and planes and flying characters zoomed around the room. All this blended together well to create a lively and engulfing soundscape. Audio quality also seemed solid, with concise, natural speech. Music showed brassy tones as well. Effects became the most impressive part of the package, as those elements appeared accurate and tight, with firm low-end response. I felt happy with this dynamic soundtrack. The disc comes with a mix of extras, and we begin with an audio commentary from director Charlie Bean, layout supervisor Devin Scott, animation director Matt Everitt, associate producer Kristen Murtha, production supervisor Alex Kauffman, editors David Burrows, Garret Elkins, Ryan Folsey, Doug Nicholas, Todd Hansen, and John Venzon and music executives Nikki Sharon, and Amanda Narkis. All sit together – connected by conference call – to give us a running, screen-specific look at story/characters, cast and performances, music, design choices, animation, and connected domains. With such a large group of participants, I worried that this commentary would become an incoherent mess. Happily, it stays pretty structured and organized. Add to that a nice level of information on display and this becomes a worthwhile discussion. Three Mini Movies appear: “Shark E. Shark in Which Way to the Ocean” (2:25), “Zane’s Stand Up Promo” (2:02) and “The Master” (5:18). “Master’ becomes the most sophisticated of the bunch, as it uses the same quality animation of the feature film, while the other two utilize cruder methods. Visual sophistication aside, all three offer amusing material. “Promo” probably works best, but I like the whole lot. A TV Series Sneak Peek takes up 11 minutes, 14 seconds and gives us part of an episode. This acts as nothing more than advertising, really. Three Featurettes ensue: “Team Supreme: Building Ninjago” (8:19), “Rumble in the Bricks” (5:19) and “Rebrick Contest Winners” (4:39). Across these, we hear from Bean, Everitt, Lego Creative Group creative director Simon Lucas, producer Dan Lin, production designer Kim Taylor, visual effects supervisor Gregory Jowle, and actors Jackie Chan, Dave Franco, Fred Armisen, Abbi Jacobson, Kumail Nanjiani and Justin Theroux. The clips look at various design choices, story/characters, cast and performances, fight choreography, and animation. We also see amateur Lego films submitted by fans. All of these work well to give us some good information. We also locate four Music Videos: “Found My Place”, “Everybody Have a Ninja Day”. “Warlord Ballad” and “Rocktagon” All simply match movie visuals with music, so they lack much merit. Deleted Scenes fill a total of seven minutes, 40 seconds. We find “Animation Bridge Test” (1:33), “Baby Fight” (2:50) and “Dock Scene” (3:16). The first two offer action scenes that exist more for test purposes than anything else. They’re fun but don’t expand the story. “Dock” fares differently, as it hints at a different direction the movie might’ve taken, It proves intriguing. The scenes all come with short introductions from director Charlie Bean. He sets up the clips in a positive manner. Under Gimme Some Outtakes, we get four minutes, 42 seconds of material. These follow the “fake bloopers” approach, as we see goofs from the Lego characters. The reel proves to be mildly amusing. A few components appear within Promotional Material. This domain features 10 clips that fill a total of 20 minutes, 28 seconds. All act to sell the movie and they bring us some clever ways to do so. The disc opens with an ad for Justice League. No traditional trailer for Ninjago appears, but as noted, the “Promotional Materials” area offers plenty of that stuff. A second disc offers a DVD copy of Ninjago. It includes the TV sneak peek and the deleted scenes but lacks the other extras. Fans of prior Lego flicks will know what to get from The Lego Ninjago Movie. While it works a bit better than its predecessors and offers reasonable entertainment, it can still feel like déjà vu. The Blu-ray offers generally positive picture along with strong audio and a decent selection of supplements. This becomes a likable but unspectacular action comedy.